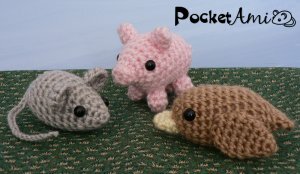 Three original mini crochet amigurumi patterns (Mouse, Pig, Bird) from the PocketAmi range by June Gilbank. Note: Take advantage of the savings when you buy this pattern as part of the PocketAmi Sets 1 & 2 multipack! Date Added: 02/26/2018 by Elizabeth L.
Date Added: 03/08/2014 by Simone N.
Date Added: 08/09/2012 by Aleksandra S.
Date Added: 05/14/2012 by Monica B. Date Added: 09/30/2010 by Amanda M.
Date Added: 06/23/2010 by Holly L.
Date Added: 05/15/2010 by Sara V.